Many rural property coined at the beginning of the 20th century, the Grötzinger village. Due to the devastation of the Second World War, much has been lost of the historic structure, but still had in the 1960s and 70s soft numerous buildings to create a new infrastructure. So many houses in the area Augustenburg- and Kirchstraße. 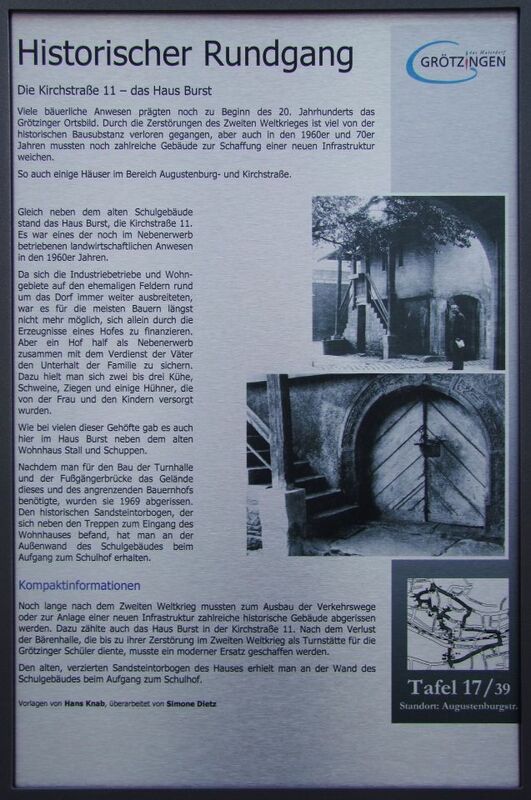 Right next to the old school building was the house burst, the Kirchstraße 11 It was one of the still operated as a sideline agricultural estate in the 1960s. Since the industrial and residential areas on former fields spread around the village and on, it was for most farmers no longer possible to finance itself solely by the products of a farm. But a court helped to secure the maintenance of the family as a sideline along with the merit of the fathers. These are held two to three cows, pigs, goats and some chickens were cared for by the wife and the children. As with many of these farms, there were also in the house burst next to the old residential house barn and shed. After the required terrain of this and the adjoining farm for the construction of the gymnasium and the pedestrian bridge, they were demolished in 1969. The historical sand stone archway, which was next to the stairs to the entrance of the apartment building, you get to the outer wall of the school building during ascent to the schoolyard.